Our plane landed at the Puerto Princesa Airport roughly around 8 in the morning. We were supposed to be on a city tour that morning, but we had to re-arrange the schedule due to our delayed flight, thus delayed arrival. So we decided to take a rest first (since we’ve got no other option at that moment), and headed over to Balai Felicisima where we spent our overnight stay in Puerto Princesa. I was kinda thankful for the slight change of plans because I was able to watch Game 1 of the NBA Finals and take a quick nap (since we’ve been wide awake since 12am). We had our lunch at a nearby restaurant called Ka Inatô where they serve local dishes. Their specialty? Chicken inasal and *drum roll* crocodile sisig. The place was just a few walks away from the place where we're staying at. The food was good and the ambiance was really nice. They even had paintings hanging all over the walls (too bad I don't have a picture of it, I'm sorry). After having our lunch, we were picked up by our tour guide, Steve, and drove our way to the city tour’s first stop: Plaza Cuartel. Today, Plaza Cuartel has become a leisure park and a remarkable historical site in the heart of the city where you could get a good view of the ocean for free. Plus, the interiors of the church were also intricately beautiful – mostly made of wood and capiz shells. 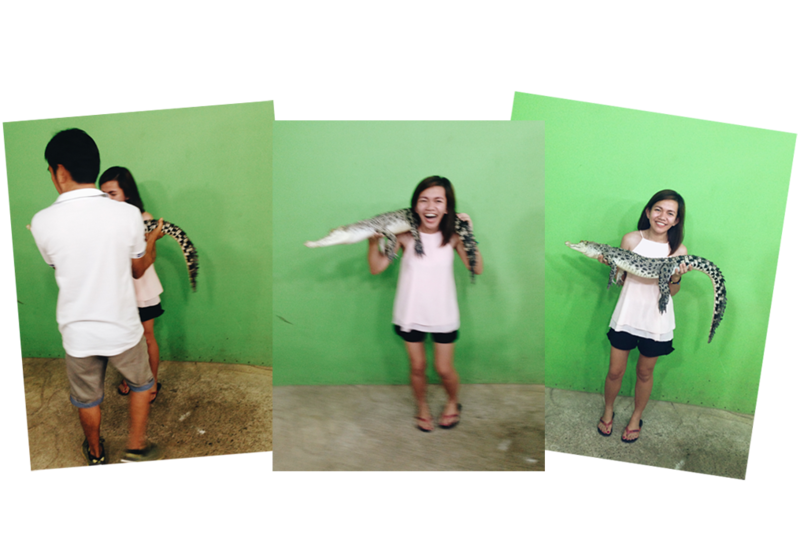 Here, we got to visit one of the biggest crocodiles in captivity in the farm. Meet Mac-mac, a 17-foot, 60-year-old croc. who eats 10 kilograms of meat daily. And take note: he’s on a diet. They may be small but those sharp-toothed babies can cut your fingers loose, so beware! It's kinda scary at first because ~gaahd, it's still a crocodile~! But this baby croc seemed harmless and its skin felt like plastic/rubber-ish against mine so we're good. And contrary to my belief -- they don't stink (or maybe this one's just an exception because he/she has to take pictures with tourists?). After that, we drove over to Baker’s Hill. Famous for catering the best hopia in town, this bakeshop-turned-leisure park is surely a place to visit when in Palawan. 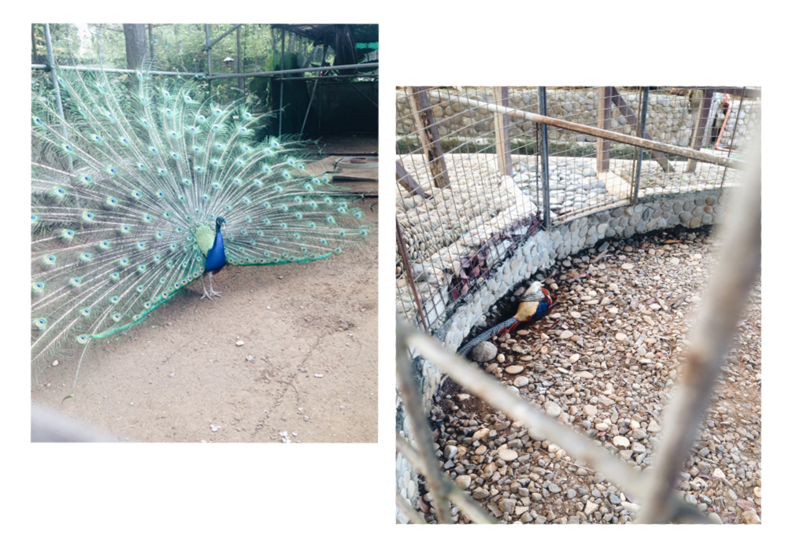 Aside from their delicious pastries and delicacies, Baker's Hill is also known for its beautifully landscaped gardens, life-size statues of cartoon characters and aviary. After that, we took a quick stop at Mitra Farm. To be honest, I had no idea who Mitra was and I think Steve didn’t mention him/her either (or was I not listening???). I did a little bit of research and according to Google, The Mitras were one of the most prominent Palaweños, mostly involved in local and national politics. One of which is Ramon Mitra who served as an advisor to the late Cory Aquino during her presidency. And to be frank, there was nothing much to see. Although the location does give a good view of the Honda Bay. We stayed there for, like, 10 minutes. 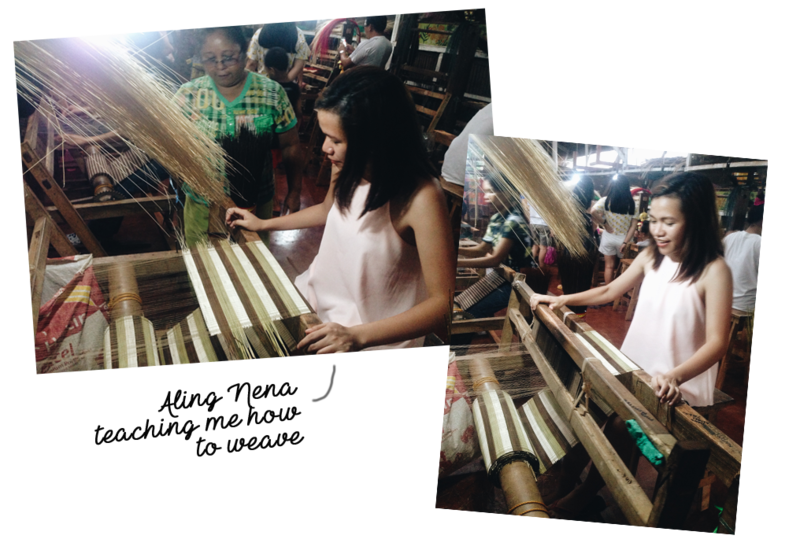 I just remember taking group photos at the Farm then proceeded to our last stop: the Binuatan Weaving Creations. This is where I met Aling Nena who has been weaving for a few years now. She even taught me how to do it, and yup, it’s a bit too complicated which makes me appreciate these kinds of works even more. 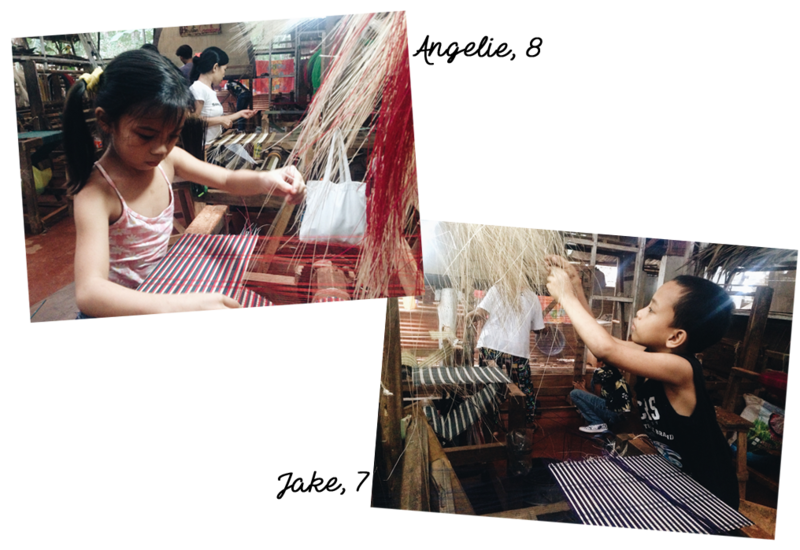 During the tour around their workplace, I noticed these two kids in their own weaving looms. 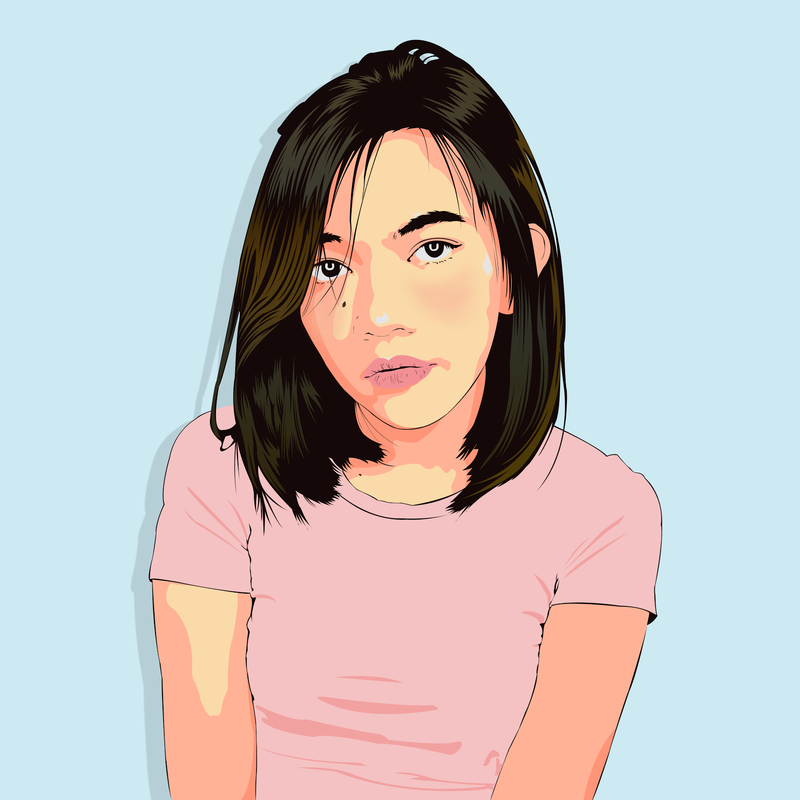 Angelie and Jake, who started out as tag-alongs of their moms and titas eventually learned the process itself and decided to do minimal work while they’re still on vacation. It's also their way to make extra baon (allowance) for school. How cute, right? And that's a wrap for our day one in Palawan! It was quite tiring but I did have fun. A half-day tour was a bit short but enough to get a glimpse of the local scene in Puerto Princesa. 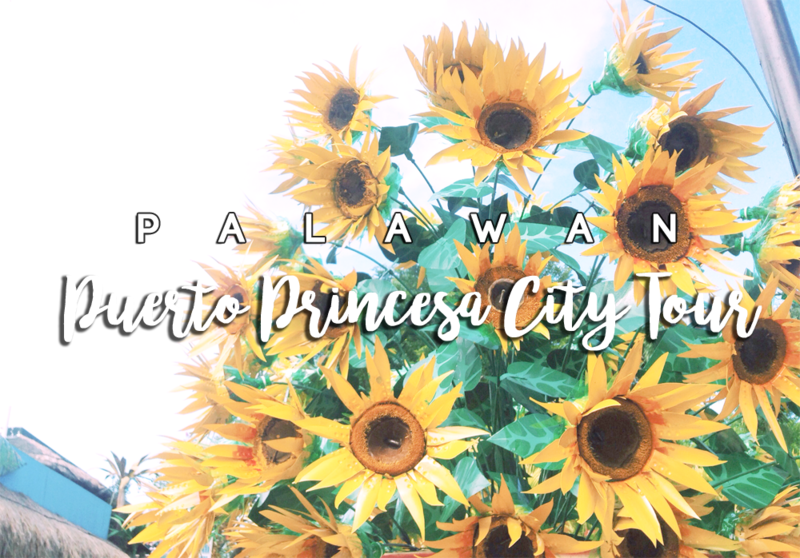 For our next site, we'll be heading over to Puerto Princesa Subterranean River National Park, so stay tuned for more of my Palawan-ventures! Hey, this one was great for a change! It showed another side of Palawan aside from its natural wonders. :) And ooh, that weaving activity looks so fun -- I badly want to try it!